I can definitely relate to the link that you make between how we are with ourselves and consequently how we are with others, so not needing to try to be loving with another so to speak but it is an extension of the love we have connected with within ourselves that innately wants to be expressed with others. It’s a fact that we are in a relationship with everything, but we try to compartmentalise things and want to believe that we can keep ourselves at a distance. Maybe we do this so that we do not have to be responsible for our actions? ‘Ripples’ are teaching us that every expression, movement has an effect on all of us and on the all. Not always what we want to feel because of the responsibility that comes with it but it always shows us we can be love and even more love at anytime if we choose so. Thanks, Amina, for how you highlight our love and valuing of ourselves as an essential factor in relationships with others. It certainly does Janet and when we deeply love and value ourselves this ripples out to every single one of our relationships. It is impossible to deny the ripples effects we have on each other. To consider that our thoughts are making ripples way before we get to work, that affect everyone in work, that is profound in its responsibility we have to not allow thoughts to run us. I know instantly when something is not right with me by the way that I walk as the way we walk reveals so much to us. It is a fact that everything we do, don’t do, say, think, how we move – everything – has an effect and far, far more and with wider ripples than we allow ourselves to be aware of. One of the reasons we choose not to be aware of this is because we do not want to face the responsibility and the changes that might be needed in our day to day life. I’m finding there is a cycle that happens. Whenever I deepen the relationship with myself, this connection must deepen with others. It is something the mind cannot fathom as it would seem there is a bigger gap between people, but instead there is a stronger beholding asking to be deepened. Whether we accept it or not, our choices, actions and words are felt and received by the whole world. Pursuing one high aim but treating other situations with distain will only lead to disappointment and pain. Relationship starts with the one we have with ourselves first and from there, the ripple effect goes out to all others and everything we do. Absolutely Gabriele and we tend to focus on our relationships with others and forget we do in fact have a relationship with ourselves too and then we wonder why we have relationship issues. It’s pretty absurd how we cry out to be ‘in relationship’ when in truth it’s impossible to be out. A better statement would be to ask to be more aware – of how our every move affects the whole world. I was attending a course yesterday and a lady approached me saying she recognised me from attending another course ten years ago. She wanted to share with me how much she appreciated the support she received from me back then. I was surprised she remembered so clearly, but the ripples we put out into the world have no time limitation, they are endless. 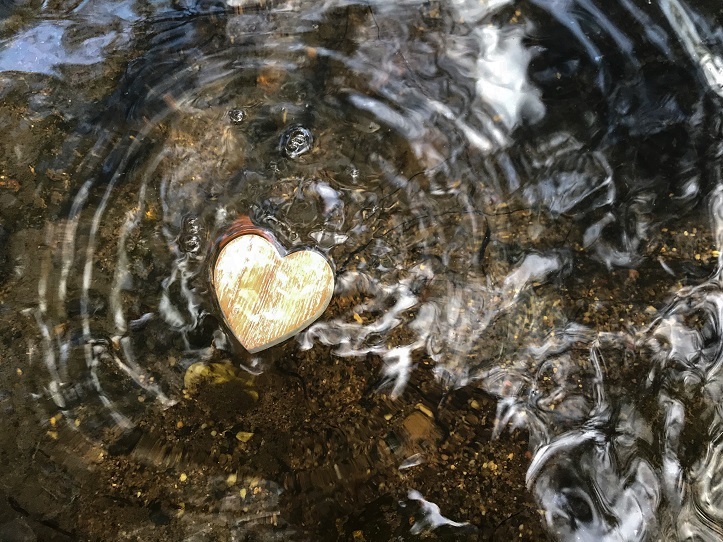 “Relationship ripples” – when there is a ripple, there is the movement back towards love if we choose the healing of understanding through observation of what is there. I have experienced recently how powerful it is to deal with my own issues and how much of a change this brings to my relationships. It’s like magic. Once I had felt my feelings in full I was able to clear them, and as a result my relationships have changed both at home and at work. Amina, thank you for sharing this; ‘Having lived a busy, hectic life with work, I started to create quiet time – ‘down time’ I called it – that helped me to stop and really consider that the way I had been with myself was not what it could be.’ I can feel how it is easy to get caught up in the momentum of work and being busy and so ‘stop’ moments feel really important. Sometimes when I stop I can feel my legs throbbing from pushing myself and the stop allows me to come back to me and move more gently and lovingly. You nailed it Amina, when you shared, “living with a deeper level of self-worth, respect and gentleness with myself, I have then been able to bring those qualities to all others and begin to build more intimate relationships all round.” As we evolve we have to start out with small steps, as it is so easy to get lost if we jump ahead of our-selves. So as you have shared “Gentleness” is a key starting point. A big hoopla is made of every crusade to save this or that when ironically all of the time we are all ‘making a difference’. What kind of a difference is simply down to what we choose. What kind of difference we make is down to the energy we choose to inspire us and then bring to others and everything in life. You mentioned about always focusing on your work first and foremost, but what if the quality of what we ‘deliver’ at work was actually determined by how we live in between, and the depth to which we connect with people in our lives which then provides the intelligence of what’s needed next in the workplace? Carrying unresolved things from day to day feels equivalent to a computer program running in the back ground slowing the system down. Currently as a society most of us live life full of complications, unnecessary burdens and an overwork stressed out mentality. It simply does not need to be this way. By making life simpler by going to bed early, waking up earlier and eating more healthily we set ourselves up with a foundation to have an amazing joyful vital life filled with love. We can see the effects of how we are so clearly on our family, friends and colleagues, but when you think about it, they all have family, friends and colleagues too, and so on. It’s quite vast considering just how many people we could have an effect on just by talking to one person. The ripple effect of how we are in our relationships cannot be underestimated. I once thought the only ripples were those coming from others, some of which I wanted to avoid and some I wanted to embrace. I didn’t want to consider my attempt to be unnoticed (and also desperate to be noticed which I wouldn’t admit) was actually me denying I have a responsibility. We are never not creating ripples – they can be with love and the rhythms of the universe, inspiring harmony, love and truth, or they can create malstroms! What we offer another can only be quantified by what we offer ourselves. As the relationship with each and everything around us counts. I can totally relate to the not resolving things by the end of the day and how this has had an impact on the way my next morning has been. Now I am totally on it to make sure things are expressed and spoken about with whom ever it needs to be with. The key thing in relationships is the reflections they bring. They highlight in the most unmistakable way what’s true and what is not. We’ve become experts at hiding from this and cutting off from life but it’s absurd to isolate when we are an equal part of the universe. Joseph that is so very true, through the relationships I have I learnt so much. It is amazing to feel how the degree of love we choose to live for ourselves is what we naturally choose to bring and honor more and more in all our relationships. I have noticed that in deepening a loving and honouring relationship with my essence, who I am within, it is this quality I want to share with others in all my relationships be it at home, at work, with friends and even people I have just met. In accepting and cherishing the fact that we are always in a relationship with our essence, our Soul, as such we either embrace it or resist it, it is through self-honesty that we then can feel the quality in which we enrich our lives with, and the quality we share with all those we are also always in relationship with. They do start with us, yet we all too often ignore that every single action of ours has an impact and the ripples go out into the world. From one harsh movement, one word said in reaction, one movement driven by self gain and of course, one act of love and tenderness. It all impacts, but all too often we choose not to be aware of the harm. “Relationships present an opportunity to evolve in one’s own relationship, along with all others equally..” – yes because being in a relationship with another highlights our very own holding quality [the way we hold ourselves in life/relationship] which can confirm for us what is true; what aspect (s) are needing to deepen, and equally it can reflect to inspire the person we’re with, imprinting together what the relationship is, and that relationships are about evolution. Society teaches us that it is selfish to look after oneself first, that it is all about looking after other people females are especially led to believe this from a very young age. What I have discovered for myself is that the opposite is actually true. I have found that the more I cherish myself in everything I do this has a ripple effect and the ripples touch everyone else without me even trying. This is beautiful, as the ripples go ever outwards they touch all with the beauty, power and love of you. Thank God for you Mary and thank God for the power of reflection. A friend of mine shared with me that for a long time she held back from expressing to her group of friends that something was amiss about their relationship and the way they interacted with each other. Seeing them a year later nothing changed, so this time she spoke up. The ripple effect was huge, not only did they change and become more harmonious, but their joint business took off with a greater clientele. This proved to me the importance of speaking up in every situation, because the ripple effect is massive. Thank you Rachel. This is a very clear example. It can be easy to let things ride and not keep up with people or situations and this is a great reminder to not only speak but also that it is never too late to do so. We think life is about creating safe environments and look all over the planet for this – never stopping to realise we are the ones making life what it is. Amina, thank you for the reminder that; ‘It’s our relationship with self-love, and the level of care with which we handle ourselves and move our bodies, that allows us to naturally be this way with others without the need to try.’ I can feel that it’s easy to focus on ‘doing good’ and being involved in lots of things that seemingly help others, but that without the self care and self love that all of this is empty and does in fact not truly support ourselves or others. What struck me from reading your blog this morning is how much unfinished business is something we carry around – exhausting us and possibly even irritating us causing anxiety frustration, anger, sadness…it is a toxic brew that we are breathing until we complete whatever it is. So seeing to business as soon as it appears is the only healthy way to go. Having said that sometimes I can read an email and, if it comes loaded, I can react so replying to it requires me to come back to a true connection with myself, settled in my body, before I can communicate responsibly to the author. Everything we do consists of relationships. Yet we can often be ignorant to the fact that we have effects on others. True Michael. We always bring a quality with every move we make, to every relationship we are in. And as you say this has an effect, whether we are willing to see, feel or observe it nor not, it remains a fact, and it is only up to us with what we are choosing as to whether it is the ‘love’ effect that ripples through the world or ‘all that is not of love’ effect that is what we share with all. This is so true, Amina – “We need to create stop moments in our day to really consider how we are truly living on a moment to moment basis and the effect that this has.” This is beautifully simple but powerfully responsible way to live in the world. The effects of how we are living are indeed huge, and that is something we underestimate. On the negative, but especially on the positive side of it. If we start living our full power, with all the love, tenderness and delicateness we are, we present people the inspiration to transform their lives, we present a different way people are looking for. “Relationship Ripples” – when a stone plops into the water or river, we can see how the ripples keep on expanding around the stone to show the effects of its presence. Without ripples there is no expansion. Without expansion there is no growth. Ripples thus become an essential and integral part of evolution with whatever that ‘stone’ is be that a job, relationship, event, situation, passing and so on. It’s amazing that when we shift or change anything within ourselves that our environment and the reflections around us instantly change too. It just shows that there is no use focusing on the outer and trying to change things around us without first looking within. Every moment, every situation that occurs is an opportunity to experience more Love than ever before. Whether we let ourselves, or not has huge tidal wave effects on the rest of our life and that of others too. If we truly wish to see change in this world, all we need do is say yes to Love in ourselves. ‘What matters is how we treat, care for and respect ourselves, as this is what we are then able to bring to all our relationships with others.’ Living in this way is key to experiencing loving and deeper connections with others, the ripple affects are felt everywhere when our choices are more loving and true.